Fast, accurate and efficient, Liquidator™ 96 is designed to speed high-throughput application workflows, without complicated programming or dedicated technician time. 1. What are pipetting stations? 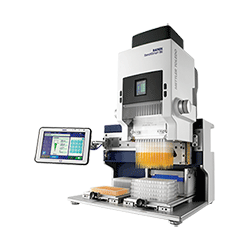 Pipetting stations are benchtop liquid handling systems that allow a user to pipette into 96- and 384-well plates with far fewer steps and greater accuracy than when using single, 8- and 12 multichannel pipettes. 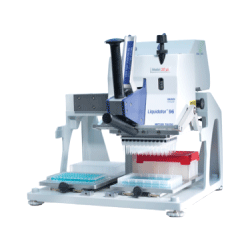 Pipetting stations range from manual and semi-automated to fully automated. In general, manual and semi-automated stations are more appropriate for research labs, while fully-automated systems are more common in production environments. As a general rule, labs that prepare more than five plates a day will benefit from a pipetting station. Three interchangeable heads for versatility: 0.5-20 µL, 5-200 µL and 100-1000 µL. The touchscreen and clear graphic menus are so intuitive, BenchSmart 96 requires little – if any – training. Preset modes include Basic, Advanced, Multi-dispense, Dilute, Reverse Volume Sequencing, Mixing and AutoPace. User has absolute control over the speed of movement, position of tips over a plate and order of plate filling. Simplifies and speeds workflows by reducing, if not eliminating, the need to swap out tips and reservoirs. BenchSmart takes up very little bench space. Put the speed and simplicity of Liquidator 96 to work on your 96- and 384-well applications. 0.5-20 µL and 5-200 µL models offer high accuracy and precision. Fast, virtually eliminates the risk of skipping or repeating wells. High channel-to-channel consistency yields high quality analytical data. No programming, training or even electricity required! 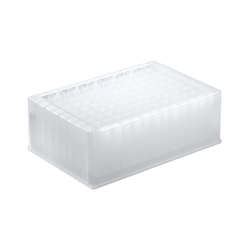 Accelerate experiments like ELISA and qPCR without sacrificing data quality. Built to exceptionally high quality and performance standards. Available SBS-format reservoirs, accessories and adjustment posts to speed throughput. Biological research is increasingly reliant on the ability of researchers to collect data from large numbers of samples. The faster numerous data points can be collected, the more quickly conclusions can be drawn and the sooner publications and products can reach the public. Discover how Liquidator 96 helps speed your workflow. ELISA is a common technique in modern biological research. It is used to detect and quantify distinct proteins in complex mixtures of proteins. Learn how Liquidator 96 improves quantitative ELISA. Singulex evaluated Rainin's Liquidator 96 to see whether using Liquidator in its ultra-sensitive immunoassay protocols could help reduce operator-induced errors, total assay time and the number of repetitive steps experienced by the operators. See the results. Browse through the list of various reviewed journal articles authored by Liquidator users. Klei, H.E., Kish, K., Russo, M.F., Michalczyk, S.J., Cahn, M.H., Tredup, J., Chang, C.Y., Khan, J., Baldwin, E.T. 2011. Image annotation and database mining to create a novel screen for the chemotype-dependent crystallization of HCV NS3 Protease. Crystal Growth and Design – special issue on the 13th International conference on the crystalllization of biological macromolecules.